The Culture Ministry on Saturday refuted allegations that Choi Soon-sil, President Park Geun-hye’s confidante accused of influence peddling, had masterminded some of the ministry’s major projects. In a press statement, the ministry denied knowledge of the documents reported to have been in Choi’s possession. It also rebuffed suggestions that Cha Eun-taek, an ad film director and close acquaintance of Choi, had led many of the ministry’s key initiatives. Last Thursday, local daily Chosun Ilbo and cable channel TV Chosun reported on documents that detailed what appeared to be government-led cultural projects with notes scribbled in what seemed to be Choi’s handwriting. In the past few days, numerous news reports have suggested that Choi and Cha held sway behind the scenes at the Presidential Committee for Cultural Enrichment, a centerpiece of the Park administration’s culture agenda. Cha served as a member on the committee “due to his close friendship with Choi,” Cha’s acquaintances told local news outlets. Among the projects reported as having been influenced by Cha is the creation of a national exercise. The Korea Institute of Sport Science had already completed developing “Korea calisthenics” over a period of two years at a cost of 200 million won ($174,000) when the Culture Ministry commissioned fitness trainer Jung A-reum, an acquaintance of Cha and a former beauty pageant contestant, to choreograph a new routine. The new national exercise, “Neulpum calistenics” was unveiled to the public in November 2014. On her online blog Saturday, Jung revealed that she had been instructed by a Culture Ministry official to lie about her involvement in the project. News reports surmise that a web of Cha’s close acquaintances “took over” the Culture Ministry, based on accounts from former officials. Former Culture Minister Yoo Jin-ryong was fired in August 2014 and six high-ranking Culture Ministry officials were asked to resign en masse. Yoo was succeeded by Kim Jong-deok, director Cha’s professor at Hongik University and a former business associate. In October 2013, two officials in charge of sports at the Culture Ministry were reportedly demoted for submitting a report detailing Choi’s influence peddling in the Korea Equestrian Federation -- Choi’s daughter Jung Yoo-ra is a rider. According to Yoo’s account, President Park herself called Noh Tae-gang, the then director of sports, “a bad person.” Noh was later asked to leave the ministry. Vice Culture Minister Kim Chong, meanwhile, is suspected of colluding with Choi. Following his appointment, his office unprecedentedly took over major ministry operations including budget assignment, tourism, sports and overseas promotions, top ministry officials told news outlets. Kim also tendered his resignation to the president. 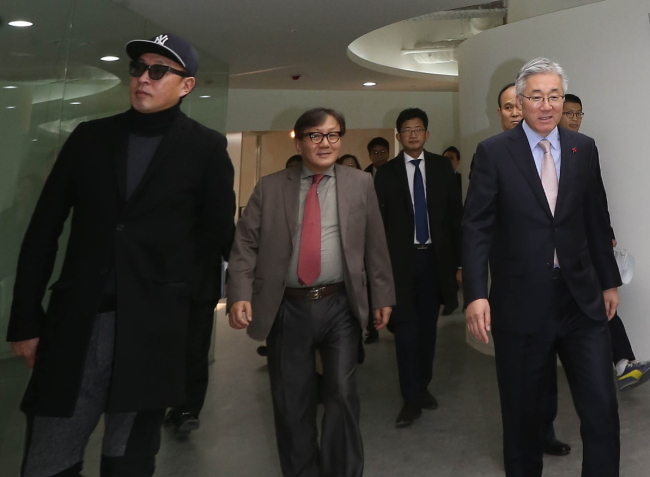 Song Sung-gak, director of Korea Creative Contents Agency -- a state-run agency that organizes major K-pop events, among others -- is another close acquaintance of director Cha. He was appointed to the post in December 2014. KOCCA’s budget was increased to 300 billion won this year, up 39.4 percent from the previous year’s 216 billion won. On Friday, the Culture Ministry refuted reports that alleged Choi had played a hand in creating the new government logo. In March, the logo, used by all government ministries ad agencies, was changed for the first time in 67 years from the rose of Sharon, Korea’s national flower, to the red and blue Taegeuk mark featured at the center of the Korean flag. Reports had alleged the Blue House rejected logo designs that had been selected by experts and public votes, deciding instead on the current design.